Dr. Smith's ECG Blog: Right sided heart failure and tachycardia. And atrial flutter was the precipitating etiology of the patient's worsening right heart failure. 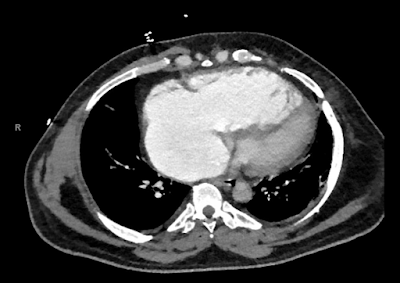 The patient in this case presented in acute right-sided heart failure. That said, from what I surmise — immediate cardioversion was not needed — which meant there was at least “a moment” to better assess clinical parameters, including the cardiac rhythm. PEARL #2: By far (!!!) — the most commonly overlooked diagnosis in all of arrhythmias is atrial flutter. This is because flutter waves may be atypical in morphology, and because flutter waves may be hidden within the QRS complex and/or ST-T wave. In adults, the rate of flutter circulating within the atria in patients who have not yet been treated with an antiarrhythmic agent (that may slow the rate) is ~300/minute (usual range ~250-350/minute). 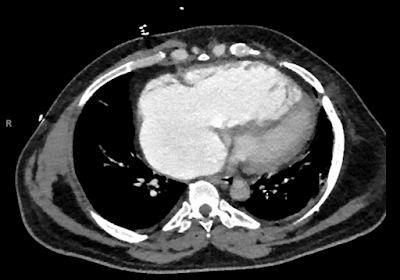 By far, the most common conduction ratio in untreated AFlutter = 2:1. 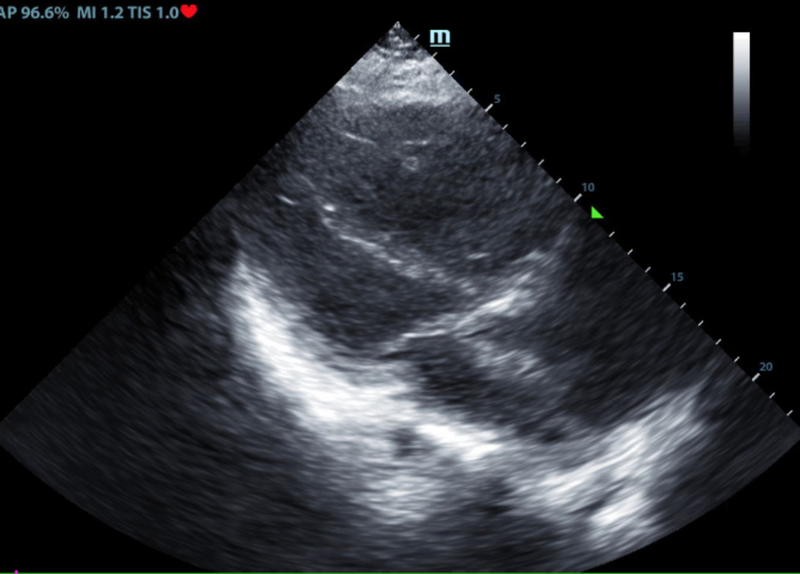 As a result, the ventricular rate in untreated AFlutter is almost always ~150/minute (within a range of ~135-165/minute). Therefore, the BEST way not-to-overlook the diagnosis of AFlutter is to always suspect it whenever you see a regular SVT with uncertain atrial activity at a rate of ~150/minute (ie, at a rate between ~135-165/minute). This is precisely the situation we have in ECG #1. 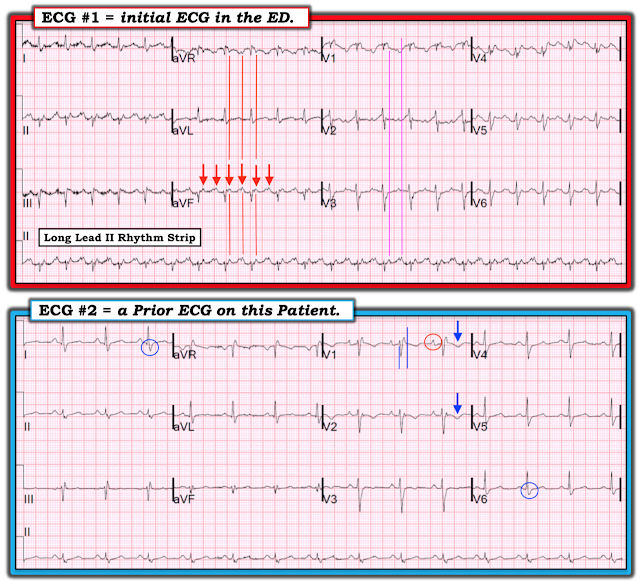 In ECG #1 — Lead aVF shows 2:1 deflections best (RED arrows). These deflections march out precisely with my calipers. There is a constant PR interval in front of each QRS complex. Since there are 2 deflections for each QRS — this means that the atrial rate = 135 X 2 = 270/minute. It would be rare indeed for ATach to go this fast (and neither sinus rhythm now reentry SVTs go this fast) — therefore the rhythm in ECG #1 is almost certainly AFlutter. And, if you step back a little bit from this tracing — there does appear to be a sawtooth pattern in each of the inferior leads. The Echo in this patient showed significant RAE and RVH. Note how difficult it is to diagnose RVH from the 2 ECGs in this case. This is common — as the ECG diagnosis of RVH is typically difficult, and often not apparent until late in the process. Signs consistent with RVH that we do see include relatively low voltage, lots of S waves, RBBB, T inversion on ECG #2 in leads V1 and V2 — and RAE. Keep in mind that there is only one condition in medicine that produces right atrial enlargement without also producing RVH ( = tricuspid stenosis) — so clear ECG diagnosis of RAE (as was done in ECG #2 by the prominent, peaked P waves in leads V1,V2) is an indirect clue that RVH is likely to be present (supported by the above noted ECG findings) — albeit definitive diagnosis of RVH required Echo. Regarding "My Take" on a Systematic Approach to ECG Interpretation — CLICK HERE. For the part regarding systematic Rhythm Interpretation — Scroll down to Figure 4 on this web page, for the “First 2 Parameters = Rate & Rhythm). 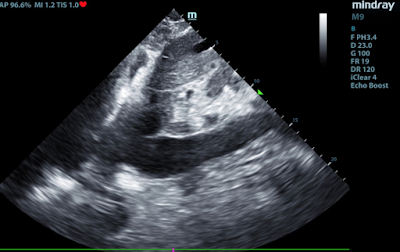 and exaggerated Negative component in V1... isn't that indicative of Left Atrial Enlargement? Right Atrial Enlargement would cause an exaggerated positive comp in V1. Right atrial enlargement enlarges the positive component only in sinus rhythm. Opposite in flutter. See the baseline ECG above in sinus: the positive component is indeed enlarged. HI DR GRAUER. Thank you very much for your invaluable comments and discussion. I wander if you have Any comment on QRS axis?, seems to be abnormal LAD during tachycardia. Awesome case dr. Smith. . Well i have few questions. 1)How to decide the P wave conducted to ventricles by just seeing PR interval. If there is a QRS for every P-wave (or every flutter wave, or every other flutter wave) and there is a fixed PR interval (or flutter-ventricle interval), then it is conducted. ST Depression and T-wave inversion in V2 and V3.